Abstract — Upright ambulation is believed to improve quality of life for persons with lower-limb paralysis (LLP). However, ambulatory orthoses for persons with LLP, like reciprocating gait orthoses (RGOs), result in a slow, exhausting gait. Increasing the hip joint stiffness of these devices may improve the efficiency of RGO-assisted gait. The small, diverse population of RGO users makes subject recruitment challenging for clinical investigations. Therefore, we developed a lower-limb paralysis simulator (LLPS) that enabled nondisabled persons to exhibit characteristics of RGO-assisted gait, thereby serving as surrogate models for research. For this study, tests were conducted to determine the effects of increased hip joint stiffness on gait of nondisabled persons walking with the LLPS. 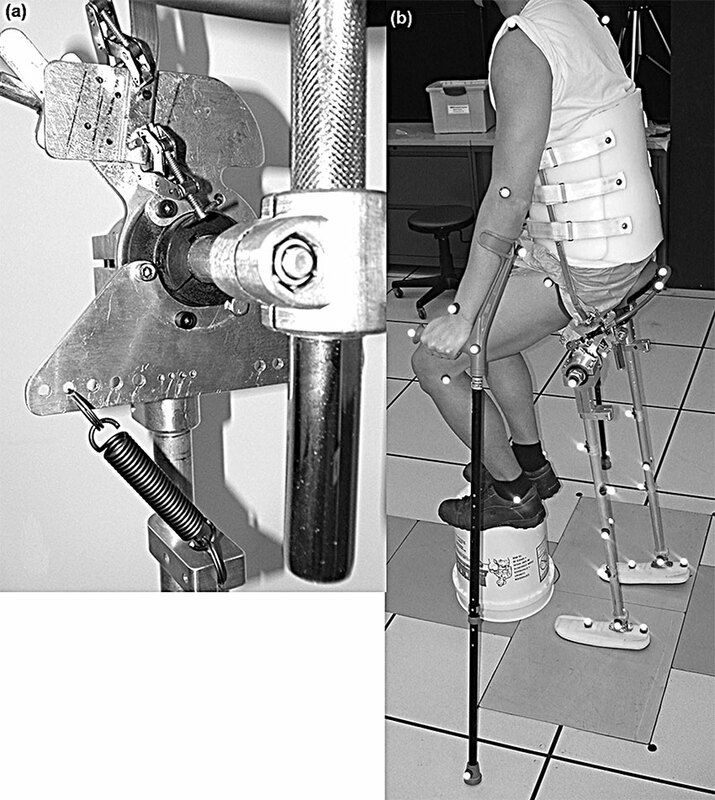 A motion capture system, force plates, and spirometer were used to measure the hip flexion, crutch ground reaction forces (GRFs), and oxygen consumption of subjects as they walked with four different hip joint stiffness settings. Increasing the hip joint stiffness decreased hip flexion during ambulation but did not appear to affect the crutch GRFs. Walking speed was observed to initially increase with increases in hip joint stiffness, and then decrease. These findings suggest that increasing hip joint stiffness may increase walking speed for RGO users. Key words: ambulation, biomechanics, gait, hip joint stiffness, hip-knee-ankle-foot orthosis, lower-limb paralysis, modeling, orthotic devices, reciprocating gait orthosis, RGO. Abbreviations: GRF = ground reaction force, HGO = hip guidance orthosis, LLP = lower-limb paralysis, LLPS = lower-limb paralysis simulator, RGO = reciprocating gait orthosis. *Address all correspondence to William Brett Johnson, PhD; Northwestern University Prosthetics-Orthotics Center, 680 N Lake Shore Dr, Suite 1100, Chicago, IL 60611; 773-319-9970; fax: 312-503-5700. Clinicians have long believed that upright ambulation can ameliorate some of the secondary health conditions that affect persons with lower-limb paralysis (LLP), such as osteoporosis and urinary tract infections [1–2]. Several assistive devices, such as the reciprocating gait orthosis (RGO)  and the hip guidance orthosis (HGO) , have been designed to help persons with LLP walk with a reciprocal gait pattern in which each foot is advanced individually and reciprocally. However, these devices are often only used therapeutically for several hours a week, and many people eventually stop using them altogether . Users of RGOs have reported that difficulty ambulating with them is a major reason for limited use , and slow walking speeds combined with high energy requirements [6–8] make walking with RGOs difficult. Previous work has suggested that large forces borne through the arms during reciprocal gait may contribute to the excessive energy expenditure . Effectively increasing stiffness of the RGO hip joints in the sagittal plane may reduce arm loading. Baardman et al. measured the forces RGO users exert on their crutches during standing with and without the reciprocal link engaged . They found that RGO users tended to exert less force on their walking aides with the reciprocal link engaged. Since the reciprocal link prevents hip flexion during quiet standing when both feet are on the ground, Baardman et al. 's test conditions can be considered as a reduction in hip joint stiffness from almost rigid to near zero. Other evidence suggests that increased hip joint stiffness can increase speed and decrease effort of walking. Rose attached springs across the anterior of an HGO's hip joints such that they resisted hip extension in late stance and assisted hip flexion in early swing . This author reported that the addition of the springs increased walking speed and reduced heart rate. These observations encourage further investigation of the relationship between RGO hip joint stiffness in the sagittal plane and the user's energy expenditure. Unfortunately, investigating the dynamics of reciprocal gait in RGO users is complicated by the paucity of device users. The population of RGO users is small and diverse, making recruitment of a large, homogenous population challenging. An LLP simulator (LLPS) was developed to allow nondisabled persons to serve as surrogate models for persons with LLP walking with RGOs . Modeling the gait of RGO users with nondisabled persons allows for the development and initial testing of ideas concerning RGO-assisted gait without the challenges of recruiting persons with LLP. The LLPS is a set of passive, mechanical legs on which nondisabled persons can sit. They can ambulate with these legs using crutches. However, LLPS users do not use their anatomical lower limbs to move, sense the positions of, or sense the forces acting on these mechanical legs. The LLPS's legs emulate certain characteristics of legs supported by RGOs, such as locked knee and ankle joints, as well as a mechanical link that reciprocally couples the motion of both hip joints in the sagittal plane. The mechanical legs are connected by a horizontal axle with a seat in the middle for subjects to sit upon so that their anatomical legs hang free above the ground, unattached to the LLPS's legs. The subjects wore a modified thoraco-lumbo-sacral orthosis that was secured to the LLPS with a system of clamps and pins. The pins ensured that the subjects were secured to the LLPS in the same position each time they donned the device. Subjects walking with the LLPS have been shown to emulate gait characteristics comparable to those of RGO users, including similar patterns for hip flexion and vertical ground reaction forces (GRFs) acting on their crutches . Increasing RGO hip joint stiffness in the sagittal plane will reduce vertical arm loading while walking. This hypothesis was motivated by the idea that the arms are used to control moments about the hip joints that are created by the weight of the trunk. If the hip joints were stiffer, then presumably they could generate moments to counteract those created by gravity and the arms would be employed less. Increasing RGO hip joint stiffness in the sagittal plane will reduce hip range of motion while walking. This hypothesis was motivated by the idea that increasing hip joint stiffness will make the hips more difficult to move and that subjects will respond to this increased difficulty by lessening their hip flexion to reduce effort. There will be a particular RGO hip joint stiffness where the oxygen cost of walking will be at a minimum. This hypothesis was motivated by the competing effects of hypotheses 1 and 2 on oxygen cost. A possible consequence of hypothesis 1 is that a reduction in arm loading will lead to the consumption of less energy and consequently reduce the oxygen cost of walking. A possible consequence of hypothesis 2 is that a reduction in hip flexion will lead to a reduction in step length and consequently a reduction in walking speed, which will increase oxygen cost. Hypothesis 3 states that there will be an optimal RGO hip joint stiffness where the benefits of reduced arm loading will be maximized without being overshadowed by the consequences of reduced hip flexion. Nondisabled subjects were recruited from a convenience sample with approval from the Northwestern ? ?University Institutional Review Board; written informed consent was obtained prior to participation in the study. Subjects practiced ambulating with the LLPS during a minimum of 12 training sessions of 30 min scheduled at the subjects– convenience. Subjects ambulated with the LLPS using parallel bars during the first three training sessions and trained with crutches from the fourth session onward, gradually building up speed and stamina. Training was considered complete when subjects could sustain a pace of 0.2 m/s over a distance of 60 m. This criterion was selected to ensure that subjects could maintain the average walking speed of RGO users as reported in the literature [6–8] for a sufficiently long duration to complete each data collection session. A spotter was present with the subjects at all times during LLPS training to prevent them from falling, and subjects wore a bicycle helmet for protection in case of a fall. Subjects were free to stop and rest at any time during the training sessions. Rest periods on the LLPS usually involved placing their anatomical legs on an elevated platform so they could unload and rest their arms. Once training was completed, data were collected from the subjects during two sessions. For both sessions, the subjects walked with four different hip joint stiffness settings: zero (the baseline condition with which they were trained), low (5 Nm/rad), medium (15 Nm/rad), and high (39 Nm/rad). The order in which the conditions were tested for each session was randomized by rolling a four-sided die. Linear springs that posteriorly spanned both hip joints controlled the hip joint stiffness (Figure 1(a)). The springs were in their neutral position at 0?? hip flexion. The combination of the spring and the reciprocal link assisted stance hip extension and hip flexion in early swing and resisted stance hip extension and hip flexion in late swing. Varying the angle and position at which the spring was attached between the vertical shaft of the leg and a metal plate secured to the horizontal axle controlled the hip joint stiffness. The geometry of the spring and hip joint system was used to calculate the hip joint stiffness for each stiffness setting. The end points of the spring and the hip joint center formed a triangle with the spring as one of its edges, so that the spring's displacement and moment arm about the hip joint could be calculated using the law of sines and the law of cosines for a given amount of hip flexion. This information, along with the stiffness of the spring, was then used to calculate the hip joint stiffness for each stiffness setting. Stiffness settings were chosen based on the results from a single nondisabled pilot subject who walked along a 10 m route with the LLPS and 10 different stiffness settings, including the zero stiffness condition, and reported his perceived effort for each setting. The medium stiffness condition was defined as the stiffness the pilot subject perceived to be the easiest with which to ambulate from among those 10 settings. The low and high stiffnesses were chosen so that a difference could be perceived by the subject when compared with the zero stiffness condition, but not so stiff as to be exhausting. (a) Posterior view of medial side of lower-limb paralysis simulator's (LLPS's) hip joint showing spring that controlled hip joint stiffnessof LLPS. Changing point of attachment of spring to one of different holes in metal plate extending below horizontal axle changed hipjoint stiffness. (b) Subject in LLPS with reflective markers attached for motion capture. Markers placed on subject's body were notused for measurements discussed in this article. Quantitative gait data were collected during the first testing session with a motion capture system (Real-Time, Motion Analysis Corporation; Santa Rosa, California) and force plates (Advanced Mechanical Technology Inc; Watertown, Massachusetts) while the subjects ambulated with the LLPS over a level 10 m walkway. Passive reflective markers were placed on the LLPS in a configuration similar to the Helen Hayes marker set  with three markers placed on each foot, three markers placed on each leg, and four markers placed on the horizontal axle (Figure 1(b)). The joints where the LLPS's legs attached to the horizontal axle acted as a simplified model of an RGO hip joint, and the markers were used to measure the motion of these joints. Eight cameras (Eagle Digital RealTime, Motion Analysis Corporation) tracked the motion of these markers at 120 Hz, while six force plates embedded flush in the floor measured the GRF acting on the crutches at 1,200 Hz. Data were collected from gait cycles where a crutch was exclusively and entirely on the force plate. Five cycles were recorded for each crutch as the subjects walked with each hip joint stiffness condition. Cortex software (Motion Analysis Corporation) was used to calculate the three-dimensional trajectories of each marker relative to a stationary, laboratory coordinate system. Hip motion was calculated from these trajectories using OrthoTrak software (Motion Analysis Corporation). Custom programs written in MATLAB (MathWorks; Nattick, Massachusetts) were used to find the peak vertical crutch force, crutch force time integral, and hip flexion range of motion for each gait cycle. These scalar values were then averaged together. Oxygen consumption data were collected during the second testing session using a portable spirometer (K4b2, COSMED; Rome, Italy). Subjects were instructed to not eat or drink anything except water for the 2 h prior to testing to ensure that digestion would not alter their metabolic processes. The session began with the subjects sitting quietly on the LLPS with their anatomical legs supported on an elevated platform for 5 min. Then, the subjects walked along a 50 m prescribed indoor route with marked 10 m distance intervals as the spirometer measured their oxygen consumption. The spirometer's digital timer was used to record the times at which the subjects crossed the 10 m marks so that their walking speed could be calculated. This sequence was repeated for each stiffness condition. K4b2 software was used to measure oxygen rate and calculate walking speed and oxygen cost (i.e., oxygen consumption per unit distance). During each testing session, the subjects were also asked for their perceptions about ambulating with each stiffness setting and whether they preferred it to the setting with which they trained. Seven nondisabled persons were recruited to participate in this study; however, two subjects did not complete training because of changes in their work schedules. Four males and one female completed the experiment (Table). Demographic information for subjects who completed the experiment. The average peak vertical GRF acting on the crutch was examined to test hypothesis 1 (Figure 2(a)). Each subject appeared to respond to each stiffness condition differently, with no clear relationship between hip joint stiffness and peak crutch GRF. The time integral of the vertical GRF acting on the crutch was also examined to determine if the amount of force applied throughout the gait cycle responded to changes in hip joint stiffness, but like peak force, the changes in force integral with respect to baseline were inconsistent across subjects (Figure 2(b)). Hip flexion was measured to test hypothesis 2 (Figure 2(c)). The hip flexion range of motion tended to decrease when hip joint stiffness increased. All five subjects walked with a smaller range of hip flexion under the high stiffness condition than under the baseline condition. Data collected during motion capture session for each subject and each stiffness condition. (a) Peak crutch vertical force (% body weight). (b) Crutch vertical force time integral (% body weight ?? s). (c) Hip flexion range of motion (??). 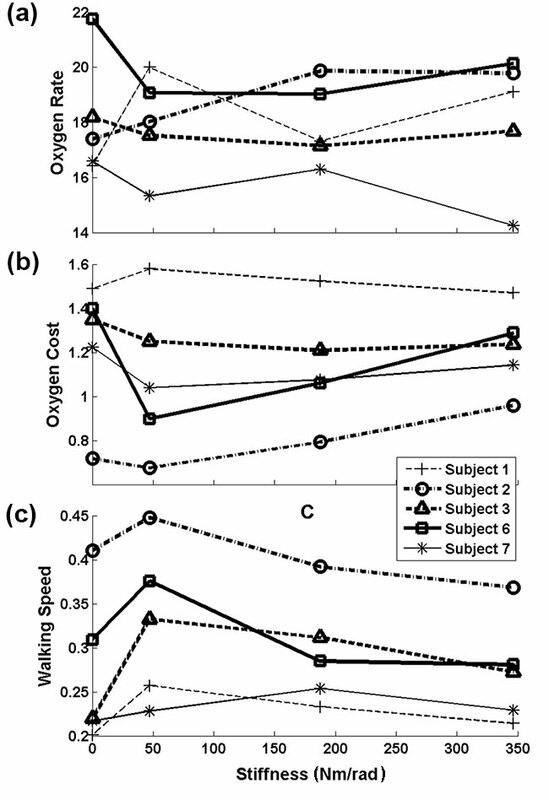 Oxygen rate was measured to evaluate hypothesis 3 (Figure 3(a)). Each subject's oxygen rate responded differently to changes in hip joint stiffness with no clear pattern. 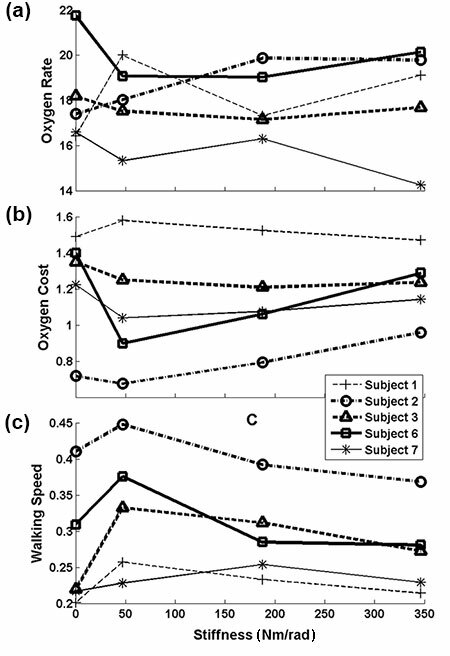 However, oxygen cost, which is a measure of walking efficiency calculated by normalizing oxygen rate by walking speed, responded to changes in hip joint stiffness more consistently across subjects. The oxygen cost for four of the five subjects initially decreased as the hip joint stiffness increased, and then increased with further hip joint stiffness increases as predicted by hypothesis 3. Data collected during oxygen consumption session for each subject and each stiffness condition. (a) Oxygen rate (mL/min/kg). (b) Oxygen cost (mL/m/kg). (c) Walking speed (m/s). Changes in walking speed were even more consistent. All five of the subjects had an initial increase in walking speed as hip joint stiffness increased, followed by a decrease with further increases in hip joint stiffness. 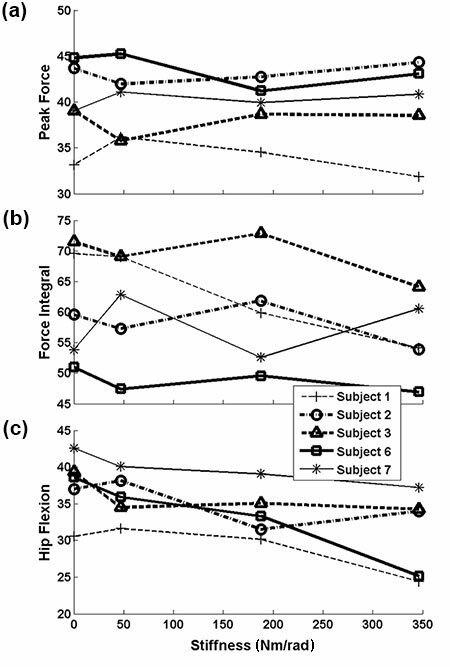 Subjects 1, 2, 3, and 6 demonstrated peak walking speeds at the low stiffness condition, while subject 7 walked fastest under the medium stiffness condition. The subjects also provided their opinions of the different stiffness conditions. Subjects 2, 3, 6, and 7 felt that they could walk better at the higher hip joint stiffness settings. Subject 1 preferred the baseline condition over the other conditions, but indicated that he may have liked the other conditions more if he had obtained greater experience with them. The purpose of this project was to investigate the effects of hip joint stiffness in the sagittal plane on RGO-assisted gait using nondisabled subjects ambulating with the LLPS as surrogate models for actual RGO users. Previous work has shown that nondisabled subjects walking with the LLPS have gait characteristics similar to those of RGO users . Hypothesis 1 stated that arm loading would decrease with increasing hip joint stiffness in the sagittal plane, but the results did not support this hypothesis. With no clear decreases in peak vertical GRF acting on the crutch or the force time integral, there is no evidence that increasing hip joint stiffness decreases arm loading. These results suggest that controlling the hip joint is not the primary function for the forces applied through the arms since changes to the hip joint impedance did not result in changes to the forces. Another aspect of gait may be driving the need for arm loading, such as elevating the body center of mass over the stance hip during each step. Hypothesis 2 stated that increasing hip joint stiffness would decrease hip range of motion in the sagittal plane. The results supported this hypothesis. The hip flexion range of motion decreased with increasing hip joint stiffness for all subjects, and the smallest range of motion for four of the five subjects was measured while they were walking with the highest stiffness condition. Increasing hip joint stiffness in the sagittal plane would increase the physical work needed to flex or extend the hip over a given range. In response, the subjects may have decreased their hip flexion range of motion so that the amount of work required for each step would be closer to the baseline condition with which they trained. Hypothesis 3 stated that there would be a hip joint stiffness for which the oxygen cost of ambulation would be at a minimum. Oxygen cost did initially decrease to a minimum and then increase in response to increasing hip joint stiffness for four of the five subjects. The oxygen consumption trials also showed that all of the subjects walked faster under the low stiffness condition than under the baseline condition. This finding was surprising since higher hip joint stiffness was expected to reduce walking speed by limiting hip flexion. This unexpected increase in walking speed could be the result of an increase in cadence, which we cannot verify since cadence was not measured during the oxygen consumption trials. Energy return from the spring could also contribute to the increase in walking speed by storing energy associated with the body's descent during late swing and releasing it to assist with forward propulsion during early swing. Increases in walking speed indicate improvements in function, and favorable comments from the subjects suggest that increasing hip joint stiffness helped them to improve their ambulation in some way. Studies have shown that people who walk better with their RGOs are less likely to abandon their orthoses [14–15]. Increasing the hip joint stiffness of RGOs may similarly improve the performance of RGO users so that they will want to continue using their orthoses and enjoy the proposed benefits of upright ambulation. Several limitations may have influenced our study results. These experiments only tested the immediate effects of increasing hip joint stiffness in the sagittal plane. If the subjects had been given more time to acclimate to the increased stiffness settings, then their behavior may have been different. For instance, the subjects may have experienced even greater increases in speed if they had been given time to practice with the increased stiffness conditions. Only four stiffness settings were used during this experiment, which may not be sufficient to fully characterize the effects of hip joint stiffness on the variables that were measured. The range and number of stiffness settings were chosen to limit subjects– fatigue during the experiments. However, testing with more stiffness settings over a broader range may provide greater insight into the effects of hip joint stiffness on RGO ambulation. Fatigue is another factor that could have affected our results. Walking with the LLPS is laborious, much like RGO-assisted gait. The stiffness conditions that were tested toward the end of a data collection session were likely affected by fatigue, while the conditions tested at the beginning of the session were probably less influenced. This difference could artificially create trends within the data. While conditions were tested in a random order to reduce the effects of fatigue on the data, the effect of randomization may have been attenuated by the small sample size. The small number of subjects enrolled in this study also increased the chance of random variation creating artificial trends or obscuring actual ones. In conclusion, the LLPS model provided evidence that suggests walking speed may be increased by varying RGO hip joint stiffness. These findings should be tested with actual RGO users to determine their generalizability to RGO-assisted gait. Finally, the factors influencing and the criteria for achieving optimal stiffness should be identified and further explored so that this parameter can be readily determined and prescribed for individual RGO users. Study concept and design: W. B. Johnson. Analysis and interpretation of data: W. B. Johnson, S. Fatone, S. A. Gard. Drafting of manuscript: W. B. Johnson. Critical revision of manuscript for important intellectual content: S. Fatone, S. A. Gard. Final approval of version to be published: W. B. Johnson, S. Fatone, S. A. Gard. Obtained funding: S. Fatone, S. A. Gard. Funding/Support: This material was based on work supported by the National Institute on Disability and Rehabilitation Research of the U.S. Department of Education (grant H133E080009). Additional Contributions: The authors acknowledge the use of the Jesse Brown Department of Veterans Affairs Medical Center Motion Analysis Research Laboratory, Chicago, Illinois, and the assistance of Ms. Rebecca Stine, MS, in collecting the data. The authors would also like to thank Mr. Edward Grahn and Mr. Dilip Thaker for their help in designing and manufacturing the LLPS. Institutional Review: This study was approved by the Northwestern University Institutional Review Board. Written informed consent was obtained from each subject prior to participation. Participant Follow-Up: The authors have no plans to notify the study subjects of the publication because they were nondisabled subjects and the results have no bearing on their well-being. Disclaimer: The opinions in this publication are those of the grantees and do not necessarily reflect those of the U.S. Department of Education. Guttman L. Spinal cord injuries: Comprehensive management and research. 2nd ed. Oxford (United Kingdom): Blackwell; 1976. Douglas R, Larson PF, D–Ambrosia R, McCall RE. The LSU reciprocation-gait orthosis. Orthopedics. 1983;6(7): 834–39. Butler PB, Major R. The ParaWalker: A rational approach to the provision of reciprocal ambulation for paraplegic patients. Physiotherapy. 1987;73(8):393–97. Kawashima N, Taguchi D, Nakazawa K, Akai M. Effect of lesion level on the orthotic gait performance in individuals with complete paraplegia. Spinal Cord. 2006;44(8):487–94. Johnson WB, Fatone S, Gard SA. Modeling the walking patterns of reciprocating gait orthosis users with a novel lower limb paralysis simulator. Proceedings of the 33rd Annual International Conference of the IEEE Engineering in Medicine and Biology Society; 2011 Aug 30'sep 3; Boston, MA. Scivoletto G, Petrelli A, Lucente LD, Giannantoni A, Fuoco U, D–Ambrosio F, Filippini V. One year follow up of spinal cord injury patients using a reciprocating gait orthosis: Preliminary report. Spinal Cord. 2000;38(9):555–58. Submitted for publication January 16, 2013. Accepted in revised form June 12, 2013. Johnson WB, Fatone S, Gard SA. Modeling effects of sagittal-plane hip joint stiffness on reciprocating gait orthosis-assisted gait. J Rehabil Res Dev. 2013;50(10): 1449–56.